The combined market cap of the so-called FAANG stocks—tech titans Facebook, Apple, Amazon, Netflix and Google—currently totals more than a staggering $2.7 trillion. If those companies were a country, they'd have the fifth largest economy in the world last year by GDP, ranking right between the UK and Germany. The power the FAANGs have come to wield over public discourse (Facebook), consumer spending (Amazon) and emerging tech (Apple & Google) has started to strike fear not only in the hearts of their competitors, but also the very consumers who buy their products and use their services. The momentum of public opinion seems to be growing, with legislators on both sides of the Atlantic increasingly seeking remedies to curb the companies' growing power. Taken together, the FAANGs have completed 398 M&A deals since the start of 2007, per the PitchBook Platform, which works out to roughly 40 transactions per year. All but Netflix have landed at least one multibillion-dollar deal. The size of some of the acquisitions completed by the FAANGs is a key reason for the uptick in regulatory interest, with large-scale consolidation prompting concerns about competition. In terms of keeping a low profile, 2014 was something of an annus horribilis: The five companies combined that year to complete 58 transactions worth some $33 billion in value, per the Platform, with both of those numbers representing the highest figures for the past decade-plus. 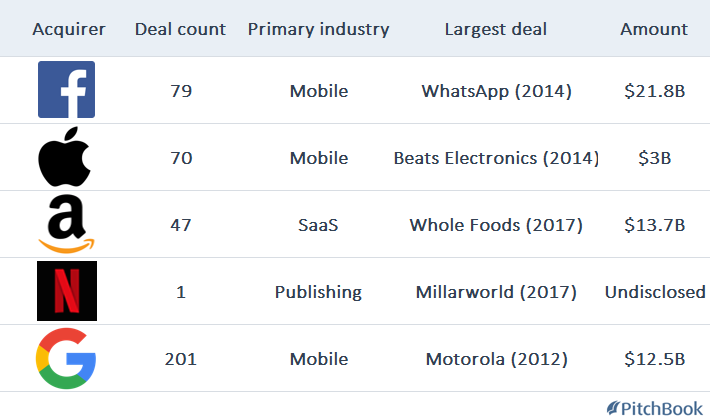 While the lion's share of 2014 deal value stemmed from Facebook's $21.8 billion acquisition of WhatsApp, that year saw several other deals of note. Facebook also bought Oculus VR for $2 billion, while Google acquired Nest Labs for $3.2 billion and DeepMind for another $650 million. Amazon bought Twitch Interactive for $1.1 billion, and Apple wrapped up its largest deal ever with a $3 billion takeover of Beats Electronics. In terms of M&A activity, there are outliers among the FAANGs on either end of the spectrum. Netflix is by far the least acquisitive, with only one deal under its belt in the past 11 years, per the PitchBook Platform. Google, meanwhile, has completed well more than twice as many takeovers as Facebook, Apple or Amazon. Although they control a similarly massive swath of the global economy, the consolidation of the FAANGs' power has not followed the same M&A patterns that led to accusations of monopolistic practices against titans in the emerging communications, energy and transportation industries of the early 20th century, when much of the current antitrust legislation was drafted. In addition, today's tech powers aren't quite as monolithic as the Standard Oils and AT&Ts of a century ago. Amazon, for instance, reportedly received a quarter of the billions of dollars spent online in the US last year. And therein may lie the rub for regulators looking to break up these behemoths: Consolidation has yet to lead to the kinds of increased costs for consumers that antitrust regulators have traditionally policed. Not a subscriber to our daily M&A newsletter? Sign up today.